When you think back to when you were younger, what were some of your favorite Valentine’s Day gifts? I’m not going to lie, even in elementary school, right at the top of my list was always chocolate. Conversation hearts were always fun, although not the yummiest if I’m being honest. Sometimes kids in my school would bring in homemade sugar cookies or other treats. That was fun. But not all of the gifts that come to mind involved food! So I thought for our second round of free printable valentines, today we’d do a great one that involves no food! This is a perfect option if you aren’t a candy fan, if someone in your kids’ classes has a food allergy, or if you just want to do something other than sweets as a valentine. This printable valentine is also a great option because there are so many different gifts you could attach to it. I’ll list just a few of those ideas below. So let’s get going! 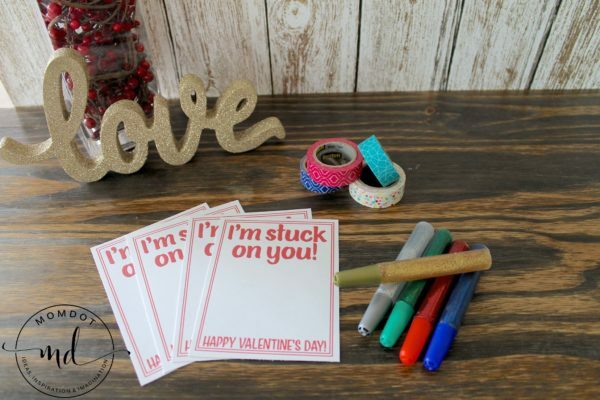 First, print off the I’m Stuck On You printable valentine that you can find in PDF form right here. We chose to use glitter glue. It’s fun and colorful! Third, cut out each card. It’s easiest to use a paper cutter, but obviously, scissors will work just fine too. Helpful hint: These printables are sized so that you shouldn’t have to trim the sides unless you want to, just one easy cut straight down the middle lengthwise and widthwise is all you need to do! Fourth, use your washi tape to attach the glitter glue (or other sticky gift of your choice) to the card. Because this is cute, decorative tape you want it to show, so have fun with using it to stick the glitter glue in place! Then, have your child sign their name on the card where it will fit. And there you have it! A cute, non-food printable valentine perfect to share with neighbors, friends, and classmates for Valentine’s Day! Let me know in the comments below what clever item you decided to use as your sticky gift!